Elin Weiss &amp; Hennie Weiss discuss the phenomenon of ‘man caves’ in commercial and domestic spaces. Last year, IKEA opened up a new store in Melbourne, Australia. As there are IKEA stores worldwide, the opening of a new one is not necessarily newsworthy, but there was an important addition to this one. It came equipped with a “manland”, a special department for men who do not wish to join their female partners during shopping. Instead, the manland offers amenities for men, such as being able to play Xbox, watch television and eat free hotdogs. But IKEA is not alone in its assumption that men, not women, need a gendered space to call their own. DIY network, known for their home improvement shows, launched a television show with the title Man Caves, in which two construction savvy men help a third man put his man cave dreams into reality. Guys need an exclusive space to hang out in their homes – a refuge where they can enjoy what they love, whether it’s a soundproofed basement used as a rock’n’roll lounge and adorned with limited edition guitars; a room where diehard ski fans can chill out with a roaring fireplace and alpine atmosphere; or a lush golf-lover’s paradise, featuring a state-of-the-art virtual reality driving range, media center and top-notch equipment storage space. We hold issue with the belief that men need a segregated space apart from women, a refuge, a no-women-allowed zone, while no equivalent of a man cave is ever mentioned for women. It thereby implies that women do not need or deserve such a space. The underlying assumption appears to be the fact that men need space to wind down, to spend time with friends and to relax after a hard day at work. The man cave needs to be a place in which men can escape, be on their own, away from their partner or children, and from everyday stresses. This is quite a privileged belief. Often the preferred man cave encompasses quite a large or luxurious area, such as the basement, equipped with a flat screen TV and other expensive items. It seems unfair that men should have their own private domain in the house/flat that they share with their partner or family. Women (especially those who have children) rarely have the time to chill out in a woman cave or to take a timeout from the family in order to spend some quality time on their own, even if they need it. 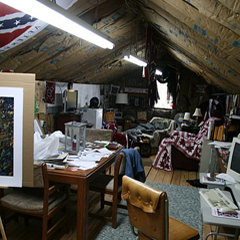 This notion of a man cave is not only expressed on Man Caves. Another television program also aired on DIY network, focusing on first time homebuyers looking for property, depicted a similar worry about a man getting his own space. A couple with a young child expressed their wish list for their new house. Except for the usual amenities, the man also wanted a man cave. At the end of the show they settled for a house that did not have an isolated man cave. The man then said: “I didn’t get my man cave”. His partner then stated: “But you did get a family room”. Even though this man had a partner and a small child he was upset that he did not get that dreamy man cave. For him, the prospect of spending time with his family in their new home did not seem enough. He wanted his man cave, seeming unbothered by the fact that his partner did not get a woman cave. What is it that make men believe that they need or deserve a separate space just for themselves? Because the term man cave implies that this man is in a relationship, or even has children. If he was single, living in his bachelor pad, there would be no need for a man cave since his whole pad would be a man cave. If many men believe that they deserve their very own space, why not extend the same courtesy to their partners? Perhaps they assume that their partner does not need that same private time and space as they believe they do. Where do these feelings and assumptions come from? So where is my woman cave? Am I important enough to ditch (if only for a little bit) my daily responsibilities in order to spend some ‘me time’ away from everyone else in the very space my partner and I share together? Why is there an assumption that it is okay for only men to enjoy such a privileged space? Whatever the reason might be it is gendered in its assumptions. While a wife may have substantial authority over a whole house in terms of design and decoration, she generally has no say about what gets “mounted on the walls” of a man’s personal space. Since it may be accepted that a woman has input on the decoration of the rest of the house, a man cave or man space is in some sense a reaction to feminine domestic power. It also states that: “Man caves have multiple purposes: they’re a place to be alone, to be away from women and from female sensibilities, to indulge in hobbies, and to hang out with male friends. It is, loosely, a male-only space to retreat to”. This definition appears to imply that women receive substantial power, authority and satisfaction solely from decorating, designing and keeping the home tidy. But does that implied satisfaction and authority relinquish her rights to use and partake in hobbies in the man cave? It is a gendered assumption to assume that when in a relationship women ‘take over’ the home, creating a frilly and feminine space that is forced upon the man, in which the man has no other option than escaping to his man cave. Assuming that women’s authority lies within the home while at the same time distancing men from the home supports both stereotypes and the need for a man cave. Feminine domestic power does not sound nearly as fun or relaxing as doing whatever one’s heart desires in a man cave. Female authority in the home sounds much more like work than fun in the man cave. Hennie Weiss is currently pursuing a Master’s degree in Sociology. Elin Weiss has a Master’s degree in Women’s Studies. Their interests include feminism, gender, the sexualisation of women and the portrayal of women in media. It is ridiculous that people still just assume that women enjoy taking care of house, children ect and have some super ability that means they never need alone time, time to unwind or concentrate on themselves. I moved in with my boyfriend late last year and one of the things I specifically told him before we moved in was the need I have for solace, to read, play on my xbox and do things to unwind. He totally accepted this and gives me the space I need, and if I want friends around I just schedule it on the times that he works in the bar so I get some along time with my friends if I need it. The thing that annoys me about man caves is, not only the name, but also the fact that its basically just a grown up tree house, like the one you run to when you want to avoid being told off by your mum, except now its one that you want to run away to when you don’t want to be scolded to do your fair share of the chores or look after the kids. If there men were mature enough to just discuss when they need a night away and allow their partners to have nights away too then there would be no need for the grown up equivalent to a tree house. bit of a luxury. could always try designing the house together in the first place? personally im of the persuasion that if it can be afforded that every adult should have their own bedroom for their stuff and decorated their own way and a place for privacy. it doesnt need to have the tv and xbox in there. i mean that seems more like a social thing unless nobody is in. it seems like a lot of them want their own pool table, gigspace and bar, and if they can afford that then good for them, but to make it a “man” thing just seems totally unfair. if women control the domestic sphere its because we have so little control outside of it, and the more childcare and workload involved, the less of a privilege that is for women in the first place! I’m well confused by the Ikea one. Why are the menfolk accompanying the women shopping in the first place if they don’t want to be in the shop? It’s one thing leaving your kids in the creche – you can’t leave them at home – but if men don’t want to go shopping why don’t they stay at home or go out or do something else? What a load of old rubbish. I have my own cave. It’s my workshop, where I can fix tools and even kitchenware; where I can fiddle with bits of wood and listen to the radio all day. If you’re not happy with the view that women must be responsible and must do the shopping and tidy the house all day, then don’t do the shopping and tidy the house. Even the scrubbiest of men have a point where they can’t stand the mess any longer. And if you’ve a partner who complains, get yourself a shed and sit there and tell him you’re impossibly busy doing stuff and he’ll have to change the baby’s nappy and get his own dinner. Sexual stereotypes are only going to be properly challenged when we stop behaving stereotypically. Ridiculous! IKEA’s ideas about man-caves are sexist on so many levels. Not only are they perpetuating the paternalistic stereotypes of woman as the carer, nest-builder and general homebody, but they are denigrating men by assuming they are little kids who want to go play while mummy goes and makes the important decisions about how they will be allowed to live in their own home. They’re also perpetuating very middle class ideas. Very many people, whatever their gender or status re-husband/wife/partner, would love to have their own personal space, with all the stuff they crave in it. Most people can’t afford it, space costs money and so does the stuff. IKEA should stick to selling furniture and stop having crass ideas. Maybe if the men weren’t shut away in the man-creche they’d be able to join in the decisions about home decor and wouldn’t feel so alienated by their own homes! This is an insulting and infantalising idea: can you imagine if electronics stores or banks had girl caves (let’s face it, they’d use “girl”) that were all pink and frilly and had a cupcake baking corner and a nail bar? There’s an element of keeping up with the Jones’s here too, if you can afford to take over an entire room as a personal playroom then show off to your mates how shiny your toys are. It’s just another marketing ploy for why you need 2 enormous TVs in your house and all the other gadgets and accessories: creating a problem that doesn’t exist then selling products to fill the niche. Especially in a recession companies want to apply this extra pressure, because you might compromise on your family TV but you man cave requires the very best of the best, either because you deserve it (pah) or because your mates will mock you if theirs are better. I wanna cave! I wanna build one for myself – a round house of cob, or some such thing. That’d be amazing. Big enough for training, chilling out, bit of a bookshelf, brewing stuff, yeah. Awesome. I find that women are ‘not always made welcome’ in the world of self-builds. I know a couple of guys who have made themselves large garden sheds for music, art projects, self expression, etc, with the skills their fathers taught them. Their wives don’t have any personal space – nobody taught them how to make it for themselves in the garden. My father could teach me, but he wont. So I’m learning from books/internet/course instead – but it’s expensive education! I think everyone needs their own space for self-expression. I also think that alot of guys are quite comfortable with the idea of redirecting family resources to just serving themselves. I think Rose has hit on a really good point about the use of family resources. Many studies show that women are less comfortable purchasing for themselves, than men, especially when they (women) manage the household budgets and give men pocket money. They often forget to give themselves pocket money too, or even where they do, they forget to spend it or redirect it back into the home. Some studies suggest this is because women often earn less and so feel that they don’t have as much ‘right’ to spend ‘frivalously’ as men. I think the mancave is a response to the home being a ‘women’s sphere’, replacing the ‘clubs’ that men of a certain income had in the past to ‘escape’ from home. In many households (and perhaps especially those where men want mancaves), women are the predominant person making a decision about decor (and this is seen as something that men shouldn’t interfere with). This very often means that ‘men’s things’ aren’t allowed to be centrally displayed, as they clash with the desired image. However, and complexly, many women do not just decorate for themselves, but for the family and for what they imagine is the proper way to decorate a family home (also a form of keeping up with the Jones’). So, they end up with a space that they have decorated, but which is never entirely their own, and, for those women who are the primary people doing housework, one that is associated with work and reputation, as much as leisure. So, the home does not hold the connotations of relaxation, hobbies and pleasure that the mancave does, and it also never exclusively female like the imagined mancave is exclusively male. However, like many people comment above, these are not the only ways to live (either by choice or the constraints of money and space). And, the promotion of the mancave does reinforce a particular type of gender relationship and domestic arrangement that is worthy of critique! I am single. The world is my cave. I think that this is a small part of a wider issue – the different societal expectations of people based solely on whether they are male or female. For example, a couple of years ago I had become fed up of people telling me I was ‘antisocial’ and ‘selfish’ because I like to retreat from the world and spend some time on my own every day. Upon doing research, I quickly realised there is nothing wrong with me, I just have a very introverted personality, however, I also found that a fairly common online gripe among female introverts is that we have a much tougher time than male introverts due to societal expectations of women. Women are seen as not needing their own space or, perhaps more importantly, their needs are not seen as being as important as the needs of everyone else around them. A woman who wants time away from the chores/family/partner risks being labelled selfish, as being female, and therefore in society’s eyes a carer/giver, is apparently supposed to over-ride personality. It is lazy stereotyping that men need somewhere to ‘escape to’ whereas women don’t – looking at some of the other comments and knowing my own experiences, this is obviously untrue. I especially like Fem123’s comment above that women are supposed to have some ‘super ability that means they never need alone time, time to unwind or concentrate on themselves’ – I think that sums up the current situation nicely. I think a lot of people would argue that the woman’s man cave is the kitchen. if I ever wanted to go to my local Ikea then manland will be my first and last place i visit. I hate going there. following the yellow arrows , making sure you dont stray off the golden path otherwise you’ll miss the exclusive bedroom designs …or be shot …..not sure which. and then trying to find a lampshade …..which is obviously called a shugnedfuglelargenberg …….easy peasy ………..
no….dont like it , free pencils good …rest bad …….that so called gray on the meat balls is not so tasty…….so manland yep …..wife leave me there and off you go. My father has his “mancave”, although we never called it this way. It consists of the basement, in which he has his office and his ‘hobby-place’ or toolshed/workplace. It has always been my favourite place of my parent’s house. My mum is, indeed, a dominant woman who always asked a lot of us. In my father’s ‘mancave’ I had the time and leasure to talk a bit with him, to listen to our favourite music together, or to read abook while he was working with his papers. He also taught me many skills, like carpentry, house painting and other technical skills, by allowing me to watch and help him fixing and building stuff for the house and his boat, in the workplace. And yes, we both needed this time away from my mother, between father and daughter. The fact that I as a a girl and young woman shared this space with him maks it not exactly a ‘mancave’, but it was a place shed away form the dominant ‘female’ influence in the house, with a definately ‘masculine’ atmosphere, and it is still the place I go to when I feel the need to talk to my dad in private. It is a place where we both feel safe and undisturbed. And I am sure it is thanks to this ‘mancave’, at lest partly, that my parents are still together. Stays the question why only men should need a ‘mancave’. I am sure that many other women are just as much in need of some private space in house as I am myself. My parents live a ‘classical’ marriage, with traditional roles for man and woman, and in their case this implies indeed that my mother has the largest (if not only) say in home decoration in the rest of the house, and that she is the abolute mistress of the house. In such a situation, other family members do need a place to be themselves. My brother, surprisingly, has much less need of this than my father and I. Which results in that I am a far better carpenter/handyperson than my brother, because I was always with my father, from the age of two on, to help him doing his share of the ‘housework’ ;) I doubt I would have been the confident, self-sufficient woman I am without the time I spent in the mancave as a child and adolescent: my father is my best friend and my greatest supporter, and this is the place where we share hobbies and thoughts alike. Couldn’t just every family member have their own cave, where they can be theirselves, and in this place only be with other family members when they want to? I was thinking on what I posted earlier today, and think I should have been more clear that my father’s personal space in the house was for me a good way of finding him alone and talking personal matters with him. I can imagine not every youngster feels the need to be alone with only one of their parents sometime, but still, the idea for everyone to have their own personal space seems to be a good one for me. On condition that it is NOT a male privilige, but recognised as a personal need for people of all sexes. A practical problem will be that not all houses/appartments offer enough space for everyone to have their own room, but that doesn’t mean the idea isn’t nice…. I think the ‘man-cave’ idea is quite new . A few years back I’d imaging it was called a pub. But now , if your lucky enough to have a local pub , its not called the Red Lion but the Piano and Warthog , serves cocktails not beer and you can eat lettuce leaves drissled in balsamic rose petal juice and not pork scratchings. Yummy ! I don’t know if this was where the expression was coined, but the book Men are from Mars, Women are from Venus refers to men needing a ‘cave’ to escape to and it was published in 1992. But, the idea that men need a separate space dates back well into the 18thC, with middle-class men having libraries, studies, drawing rooms and the like that were envisioned as women-free spaces (if more complexly used in practice). I realize that the comments here are quite old, but I have been advised to read this post by a potentially former friend who now believes I am a “blind” sexist. I was under the impression that a “man cave” was a location in a house or on a property that was sectioned off somehow from the main area of a house according to agreement by, in this case, both the husband and the wife. The point of the area was for the man to have an somewhere that he could furnish and use according to his own whims or desires without having to negotiate or compromise with his wife (as the co-inhabitant of the house, in addition to her role as his wife). It could be called a “man cave” because the occupants would be the man and his male friends the vast majority of the time, either because it is his personal space and therefore the location in which he chose to entertain certain friends, or because the wife does not share an interest in whatever items/activities/hobbies that had been placed inside. I am not married nor do I live with a significant other, but what I have outlined above regarding cohabitation/responsibility/authority of areas in the house has been my impression of how things are “supposed” to work. I have not addressed every point mentioned in the post, but I am also speaking from the words I have had with the person who directed me here. Is what I have explained here an explanation of a minority of “man caves,” or have I grossly mistaken their definition? Given that sexism does exist, I would expect it to be present in a range of societal phenomenon, but I suppose my question is this: is a “man cave” an inherently sexist creation?